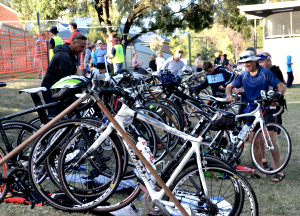 The Rutherglen triathlon is over for another year. Thanks to all those who participated on the day and we hope you enjoyed the event. The results are now complete and ready for download. A special thanks must go to our sponsors - IGA Rutherglen, Campbells Wines, Full Cycle Albury, and the Shire of Indigo for the use of the pool and providing lifeguards for the triathlon. We must also thank the local Police, CFA and SES for escorting the bike rides and traffic management. Rotarians took a lot of photos during the event. I will endeavour to get them up onto face book over then next couple of day. If you have any comments on how we can improve the event please feel free to email us. The Rutherglen Country Fair is one of the largest regional markets in Victoria. It is held on the Sunday (9th June) of the Queen's Birthday long weekend from 9am to 3:30pm and is part of the popular Winery Walkabout . If you are interested in becoming a stallholder at this years Country Fair it can now be completed online or can be downloaded and printed. Rutherglen main street traders please do not complete an application until you have been contacted by the secretary. Applications will close on Friday 10th May. The Rutherglen Triathlon will be held on Sunday 10th March 2019 at the Rutherglen Pool and is a community event that is on same weekend as the gourmet event the Tastes of Rutherglen. The Short Distance Event (Junior and Back of the Pack events) comprises a 10Km ride, 200m pool swim and a 3.5Km run. It is designed for the younger participant. The Back of the Pack event is the most popular category and is for adults wanting to complete the shorter event. The team event is for families (eg mum, dad and child) who want to compete together. There are numerous categories in each event including both individual and team events and has over $1500 in cash and prizes. All events are supervised by the local SES, Police and Rotary. For further details including catrergories, location, rules and online entry etc click here.